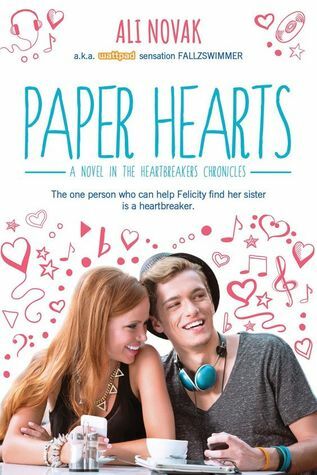 Despite my just so-so like for The Heartbreakers (The Heartbreak Chronicles #1), I decided to give Paper Hearts (The Heartbreak Chronicles #2) a chance. After all, this is Alec’s story, the cool character I have been intrigued by in the first book. But much to my disappointment, I didn’t like the 2nd book like I have anticipated. Alec, the cool, shy, hard to figure out guy, obviously with baggage as well, in the first book seemed to disappear. And a whole new different Alec was seen in Paper Hearts. Alec, who was kinda straightforward, kinda bold, and kinda not shy anymore. Paper Hearts is the story about Felicity and how her world intertwined with Alec’s in a sorry-i-have-spilled-coffee-on-your-dress-let-me-make-it-up-to-you kind of way. Felicity is looking for her “runaway” sister and Alec, being drawn to her, decided to help. They travelled together, along with her 2 bestfriends, Asha an Boomer, across San Francisco towards Seattle, stopping by at Oregon where the rest of The Heartbreakers currently are. Across the two books, I think only JJ’s pervert character and Xander’s allergy remained constant. It’s a light read yeah but I didn’t enjoy it that much. I didn’t feel the sizzle or the romance I normally feel for the two main characters of the story. I skipped some parts and willed myself to finish the story still. Despite not really enjoying the flow overall, the story still has those moments when you’re imagining yourself as the character so that you’ll be able to experience that sweet, sweet moment the character is experiencing. However, those moments were not enough to outweigh the overall feeling. Okay. So I decided to first read Ali Novak’s (aka Fallzswimmer)‘s debut novel which also happened to take form as a Wattpad story. It’s really a writer’s dream come true! She had started the novel when she was only fifteen. What a feat. Given that I’m a frustrated writer, I really admire and envy her at the same time. I honestly liked My Life with the Walter Boys more so than The Heartbreakers. There is a certain theme the way Ali Novak writes her novels based from what are currently published (My Life with the Walter Boys, The Heartbreakers, Paper Hearts). There is this big problem which is supposed to be heart-wrenching, dramatic, which drives the protagonist of the story and wherein the guy will then get warped into. However, I can’t seem to connect with the “driving force”of the characters. Nonetheless, I’ve completed two novels and am halfway through Paper Hearts at the time of writing. My Life with the Walter Boys is about Jackie and how she started living with her mom’s best friend’s family after her whole family died of car accident. Katherine, her mom’s best friend happens to have 12 kids (11 boys + 1 girl). And of course, romance ensues. She was caught in a love triangle between two of the brothers, Cole and Alex. Then, in the end, it’s Cole who won. I still felt not much connection to the tragic story behind the girl protagonist because it’s not really showing much in the emotions Jackie is seen all through the novel and there’s not enough background with the family itself to invest my feeleings in but i honestly liked the story. With a lot of characters to work on, Ali Novak did a pretty good job tying everyone in the story more or less. I also liked the interactions between Cole, Alex, and Jackie, the three main characters especially. There’s a lot of buts and why is he/she acting like that moments but all in all, I think I liked this novel best so far from her. Recommended for those who wants a sweet, easy read.